We have already reviewed the pedal that started it all, the B3K Microtubes pedal, and also the variant, Vintage Microtubes, as well as the latest incarnation: B7K Ultra. 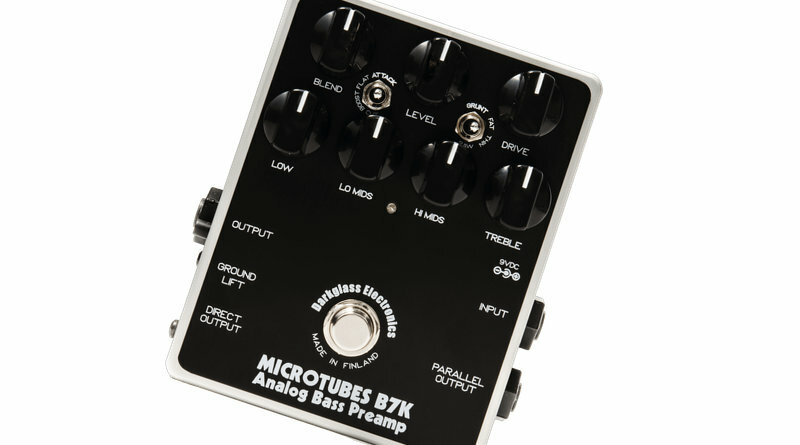 So does it even make sense to look into the B7K Microtubes pedal? Absolutely! Although it is definitely related to the other Darkglass drive pedals, it is indeed a beast of its own. 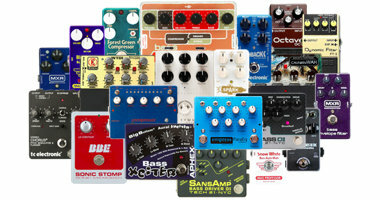 The B3K pedal is a dedicated overdrive pedal, as is the Vintage Microtubes. The B7K has the same drive circuit as the B3K, but in addition it also comes with a powerful 4-band preamp plus a DI output to feed the Front of House PA system at a venue. The B7K Ultra is a new incarnation of the B7K under review here and it has a slightly more advanced preamp section that allows you to choose between 3 different center frequencies for the HI MIDS and LO MIDS. 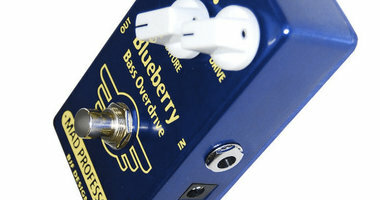 It also has a separate footswitch for the distortion circuit that makes it a bit more versatile. The price, on the other hand, is also a bit higher. Well, with that in mind, let’s get started. The B7K Microtubes pedal gives you 7 knobs, 2 3-way toggle switches, 1 footswitch, 3 jack connectors and 1 XLR output for the DI signal. The top row of 3 knobs control the drive circuit. Starting from the left side, the BLEND knob lets you mix your clean signal with the dirt signal. 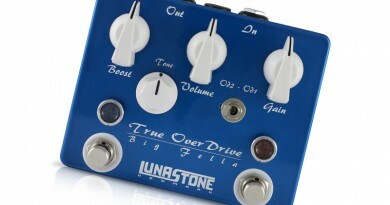 The middle knob is setting the LEVEL and the DRIVE knob controls the amount of overdrive / distortion you want to apply. As part of the drive section, there are 2 toggle switches. The left one is named ATTACK and affects the high frequency area. Your options are either FLAT, BOOST or CUT, which should be rather self-explanatory. 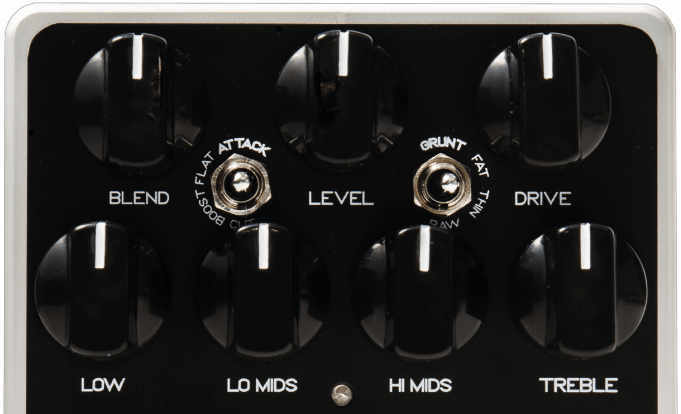 The toggle switch on the right is named GRUNT and affects the low end of your tone. You can choose between FAT, THIN or RAW. 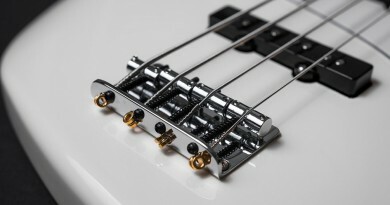 The lower 4 knobs belong to the preamp section and is laid out in a simple way much like the preamp section on a classic bass amp: BASS, LO MIDS, HI MIDS and TREBLE. 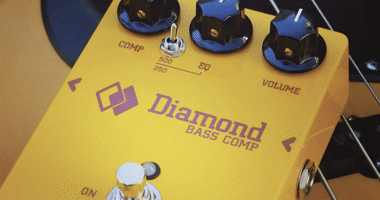 The preamp section is global in the sense that you can use it on your clean tone by turning the BLEND knob all the way down, but it also affects the drive circuit – even if you dial the BLEND knob all the way up, cutting out the dry tone completely. On the connector side, you get the standard IN and OUT 1/4″ jack sockets, but also a PARALLEL OUTPUT as well as the above-mentioned DI output on a male XLR socket. The approach is a mix of methodical and ‘various settings’. The first 4 rounds are strictly methodical and zoom in on each of the 4 tone control knobs of the preamp section. The tone is clean and the sound clips are based on a fingerstyle part. The next two rounds are based on a slap groove and demonstrate various settings of 1) scooped tones and 2) slight dirt. The ATTACK and GRUNT rounds are methodical as well, each zooming in on how the different positions of each toggle switch sound. The final round is a picked part that simply demos a number of various settings with lots of drive. The first thing to mention is that the sound of this pedal is amazing. That is the first premise for even being versatile and useful. The preamp on its own is brilliant. The range of each tone control knob is well thought-through and you can in many cases use the full range, which is pretty rare. Maybe you wouldn’t use the BASS knob all the way down, or the TREBLE knob all the way up, but in general the frequency ranges work great and the amount of boost/cut you have available is for the most part really good – especially in the always-critical mid range. As a drive pedal, the B7K delivers exactly as you would expect. It has that very significant and clear tone of the original B3K, but the extra layer of tonal control from the preamp definitely adds to the versatility parameter. The PARALLEL output and the DI are very handy features that you may or may not need. But they are nice to have just on case. I usually use the DI on my amp, but it’s actually nice to know that I have an alternative DI solution available should anything happen. Overall, the B7K is very versatile and you can use it with equal great results as a clean preamp and a full-blown drive pedal. It also works really, really well in the grey zone in between. Just adding slight amounts of dirt, or even with the DRIVE knob all the way down, and blending the circuits gently has a profound affect on your core tone that to some may be just what you need regardless of musical genre. This pedal is not ‘just’ for metal and hard rock players! 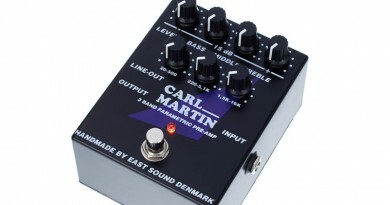 The quality of this pedal just oozes ‘hand-built-in-Finland’. It’s solid and it’s classy all the way through. Everything about it feel (and sounds) great. Sure there is some hiss going on in the background if you add tons and tons of drive and/or boos the treble a lot, but that is only to be expected. Absolutely nothing unusual in that regard, and to be honest, I have heard many other pedals with much more noise without delivering the same amount of sweet-sounding gain. If I should mention anything about the design choices, it would have to be the toggle switches that can be hard to access on the fly. They are crammed in between the knobs, but having said that, I am sure that 99% of the time, you would be using the one setting for these switches that you have found works the best for you. I like most combinations of settings, but the THIN setting on the GRUNT switch really does give you a very thin sound and also a quite significant drop in overall output volume. You should not switch to this position mid-song, as you would have to quickly counter-adjust your overall level somewhere else in your signal chain. Just for the record, my personal favorite setting of the toggle switches is FLAT on the ATTACK and FAT on the GRUNT. The RAW setting on the GRUNT is also nice and depending on the context both the BOOST and CUT settings on the ATTACK switch are perfectly usable. You might argue that some of the knobs could have been smaller in order to make the toggle switches more accessible, but all of the knobs are good to have easy access to on the fly, so at the end of the day I do support the choice for large knobs and ‘crammed-in’ toggle switches. When the B7K Ultra was introduced, the price on the B7K dropped a bit, and today (2016), you can buy a new one from approximately $329. This obviously puts it in the higher end of the price spectrum, but the pedal is definitely also to consider a high-end product in its category. Even with the price in mind, I think there is plenty of value for money if you are looking for a superb drive pedal that also has the capability of sculpting your core clean tone thanks to the great preamp section. The B7K is an amazing drive pedal – and an amazing preamp pedal. The preamp side can be used in isolation, but you can also take advantage of it when you dial in some dirt. That said, the single footswitch makes the pedal most useful if you choose to use it for just one of the things. If you would like to use the clean preamp as an always-on tone shaper and only want to kick in drive once in a while, you would have to set the drive setting to your liking and then know exactly where to set the BLEND knob on the fly. I guess the best fit for this pedal is if you use a lot of drive and have your clean tone taken care of elsewhere. Then you can use the drive circuit and the preamp in combination to tailor your absolute dream distortion tone – and kick it in using the footswitch whenever you want. If you want to use a preamp all the time and only kick in drive – and you want this kind of tone – you should take a look at the newer B7K Ultra that has a dedicated footswitch for the drive circuit. It does cost a little more, though.